So on Tuesday The Phi started her new school. This is her second year of pre-school and with the new school comes lots of changes. This year The Phi is in school full-time (except on most Fridays, because I usually work a half day on Fridays. 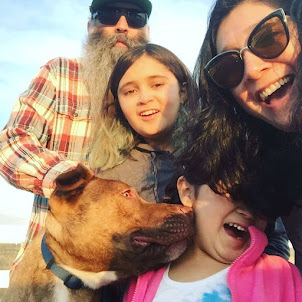 We Punk Rock Parents like to get our weekends started as early as possible!) Also this school does not offer a lunch (except pizza Fridays!) 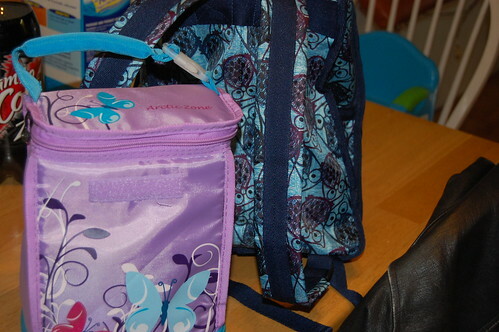 so The Phi has to take her lunch to school. Now since I am the one who gets her to bed at night, gets her up in the morning, ready for school, drives her to school, and picks her up from school, I figured the LEAST PR Dad could do was be in charge of her lunch and snack. This year she also had to take a back pack. We totally lucked out and found this adorable owl backpack at Target. Seriously, how cute is this? Next thing I knew it was time for the annual by the front door photo. Is she not the cutest thing you have ever seen? I seriously cannot stand it!!! All 3 of us drive over and The Phi was way excited about school. We walked her to her class, she sat right at her desk and was ready to go! After only a few days when I went to pick up The Phi her teacher told me that she was impressed at how behaved The Phi is. So with school starting our schedule is a bit shifted. Our days seem to be flying by. Before I know it, it's bedtime and we start all over again the next day. I am so proud of The Phi. I was one of those crying kids on the first day of school. Even in graduate school I would get really nervous and a stomach ache on the first day of classes. The Phi has none of that anxiety and instead is filled with excitement. Just like her Dad use to be. "Mom did you know that God made everything.....even iPhones!" Oh the things kids say! I love it! Great photos! she is adorable! love the shoes! LOL!!! cute back pack and lunch bag. how do you like the classroom and teachers? i totally forgot to get chones 1st day of school pic! crack! ill just have her wear the outfit again and take it. She really is too adorable, especially in that uniform. Even Cyrus made a comment about it! Phi is very impressive, and the news about iPhones is startling. 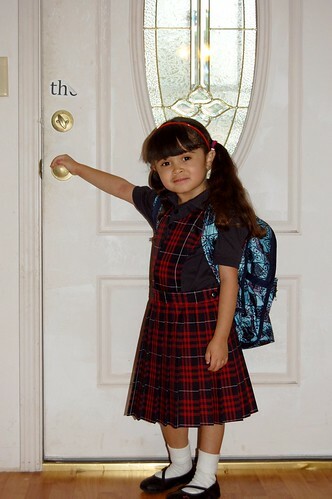 she looks soo adorable in her uniform! 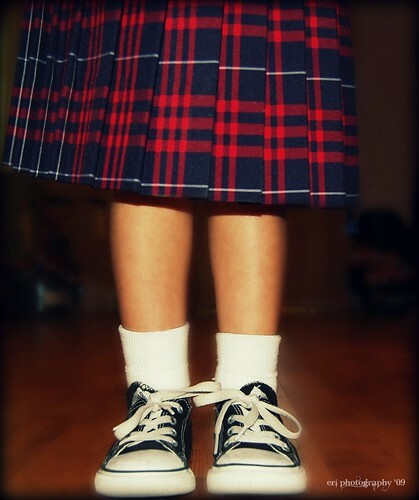 I love the photo of her in her uniform skirt and chucks. So cute. So punk rock.